Welcome to 1407 Trail View Place where every day is resort living. This 1734 sq. 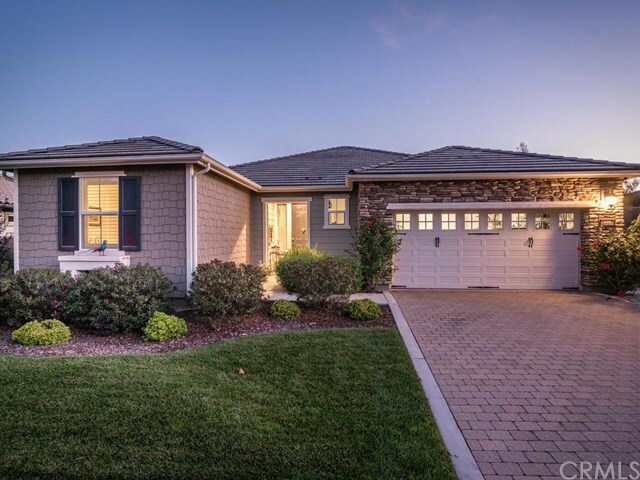 ft. Monterey II solar home is situated on a premium lot with expansive southwest facing views of the Challenge golf course and lake. Youâll enjoy those magnificent views from the comfort of the designer outdoor room with its stacked stone gas fireplace, coated cement floor and modern shutters. Adjacent is a welcoming pergola that leads to the professionally landscaped backyard. When you head inside through French doors youâll feel the spaciousness of the open floor plan, abundance of natural light, and modern designer touches throughout, including hardwood flooring dynamically laid on the bias. The kitchen and dining area is dramatic with industrial modern cabinets, fixtures, lighting, top-grade stainless appliances, water filtration and elegant quartz countertops. The designer touches continue to the Master Suite. Youâll wake up to more incredible views via the sliding doors with plantation shutters. The master bath features the latest in design trends with linear ceramic floors, translucent glass tile shower, modern cabinets, quartz counters and a spacious walk-in closet. The guest suite offers plantation shutters, closet organizer, and a full bath with custom granite counters. The den is outfitted with unique bookcases and plantation shutter doors to provide you with an optional third bedroom. And best of all, this beautiful home is located in the highly desirable resort community of Trilogy. Directions: 101 to Willow. West on Willow. Left on Via Concha. Left on Trail View and the house will be down the road on the right hand side.